“NASA’s Cassini spacecraft is headed toward its Sept. 15 plunge into Saturn, following a final, distant flyby of the planet’s giant moon Titan. The spacecraft made its closest approach to Titan today at 12:04 p.m. PDT (3:04 p.m. EDT), at an altitude of 73,974 miles (119,049 kilometers) above the moon’s surface. The spacecraft is scheduled to make contact with Earth on Sept. 12 at about 6:19 p.m. PDT (9:19 p.m. EDT). Images and other science data taken during the encounter are expected to begin streaming to Earth soon after. Navigators will analyze the spacecraft’s trajectory following this downlink to confirm that Cassini is precisely on course to dive into Saturn at the planned time, location and altitude. This distant encounter is referred to informally as “the goodbye kiss” by mission engineers, because it provides a gravitational nudge that sends the spacecraft toward its dramatic ending in Saturn’s upper atmosphere. The geometry of the flyby causes Cassini to slow down slightly in its orbit around Saturn. This lowers the altitude of its flight over the planet so that the spacecraft goes too deep into Saturn’s atmosphere to survive, because friction with the atmosphere will cause Cassini to burn up. Cassini has made hundreds of passes over Titan during its 13-year tour of the Saturn system — including 127 precisely targeted encounters — some at close range and some, like this one, more distant. Cassini is ending its 13-year tour of the Saturn system with an intentional plunge into the planet to ensure Saturn’s moons — in particular Enceladus, with its subsurface ocean and signs of hydrothermal activity — remain pristine for future exploration. The spacecraft’s fateful dive is the final beat in the mission’s Grand Finale, 22 weekly dives (begun in late April) through the gap between Saturn and its rings. No spacecraft has ever ventured so close to the planet before. The Cassini spacecraft was launched in 1997 and arrived at Saturn in 2004. 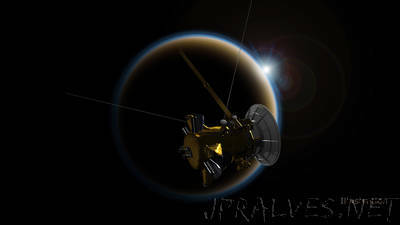 During its time there, Cassini has made numerous dramatic discoveries, including a global ocean with indications of hydrothermal activity within the icy moon Enceladus, and liquid methane seas on another moon, Titan.